Stretch marks are caused mainly when a person gains weight and the skin grows rapidly causing stretch marks. Even though our skin happens to be very elastic, nevertheless over stretching may lead to stretch marks. It usually happens at the time of puberty when girls and boys body go through a speedy change, during pregnancy or when you happen to gain or lose weight. With elastic skin, sometimes the production of collagen gets affected which can lead to stretch marks in many areas of our body, such as the bikini area, stomach, thighs, hands, breasts, hips, legs and even buttocks. Even though the stretch marks appear to be normal from outside, the stretching actually occurs inside. The lower layer of the skin which provides it strength and elasticity tend to get thinner and uneven. As you know, skin is very transparent, and if you look closely even blood vessels can be easily seen. This is why we can see the stretching which has occurred as well. Men suffer from stretch marks too. These stretch marks usually disappear over a period of time, but some can last as well, depending upon the marks, and how they were caused. 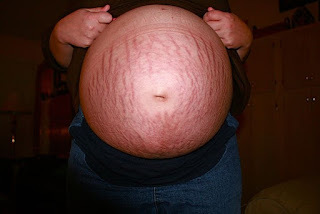 Stretch marks start to develop in some women, who are pregnant on the abdomen during their second half of the pregnancy. The skin stretches to accommodate the growing baby, which is growing daily. The color of the marks, can depend sometimes on the color of your skin. Depending on your skin color the mark may begin as a pink, reddish, brown, or dark brown color. These reddish-brown marks fade gradually with the passage of time, and later on may look like shining silver lines. During their pregnancy, women may notice the stretching of skin a lot near the abdomen and breasts. These are normally caused partially due to hormonal changes. Women who have weaker collagen tend to get more stretch marks than others and may require even more time for the marks to heal, or fade. Research has showed that due to frail pelvic ligaments, some women might suffer from stretch marks, in the pelvic region as well. This can sometimes be prevented by doing pelvic floor exercises. Bodybuilders have also been known to get stretch marks due to the rapid growth of their bodies as well, which in someways are similar to pregnant women. Remedial measures for stretch marks that I have recommended to my clients, and readers are below.